" A Good Mom Has: bad days/great days, normal days trying days, overwhelming days/silly days, perfect days/supermom days, just being a mom days/crazy motherhood days and a whole lot of infinite love." Got this inspiration from Scarlet Reece. It fits so perfectly for Mother's Day. For all the mother's that feel like they are failing or having a hard time. We have all been there and know you are not alone. You are strong, resilient, and blessed. We have all kinds of days every day of the week but we would not trade our kids for anything. They are our bright side and light always. Yup, that about sums it up :) Being a mom is the hardest thing and the BEST thing in the world. I wouldn't change a thing. You said this so well and yes we have all been there a time or two. All worth it and I wouldn't change anything over being a mom and now a grandmother. Tons of blessings. This is very well said! We have good days and bad days but no matter what there's always love. I'm a quote lover! I even have a Pinterest board with my fave quotes and this one ranks way up there. Being a mom is the best job I've ever had. That doesn't mean it's been perfect or smooth sailing, but well worth it. Love this! I super salute all womens in the whole world. Being a mother is never easy and its the tough job everyone could have. Kisses to all mother's out there. I think we put too much pressure on us as moms. This is the perfect reminder. This is so true. Not all days will be perfect and it is important to focus on the positives while doing the best we can! I am going to send this to my Mum as it sounds perfect for her. Something she needs to remember often. This is such a great quote - about life in general, but definitely about being a mom. There are definitely bad days and good days! This is a perfect quote. I'm pretty sure today would count for all of these kind of days! I love this. I really like this quote. It just about sums up what Motherhood is really like! It's hard, but it's wonderful. I can relate to this post as I feel like a failure as a mom some days. I also see the grace given to moms within the same quote. Mothers do really have infinitely love! My mom is awesome and really caring. Happy Mother’s Day to all! I totally agree! Hopefully good days outweigh the bad ones, but some days I feel like throwing in the towel! What an honest quote to share for Moms everywhere. I think the need to be super mom, perfect and not make mistakes is pushed upon us. It's like we give ourselves the hardest time of all, being a mom is being a happy mess and having happy kids who simply love us! This is a good perspective to have and it's the truth. It actually applies to a lot of different people including fathers, not just mothers. Love the quote. You made my day. I am now remembering my Mom! Come what may, she used to stand by us. We as kids always would go to her for anything and she never complained if she was ill or tired. A mother is a true angel sent by God! Love this quote and I completely agree. 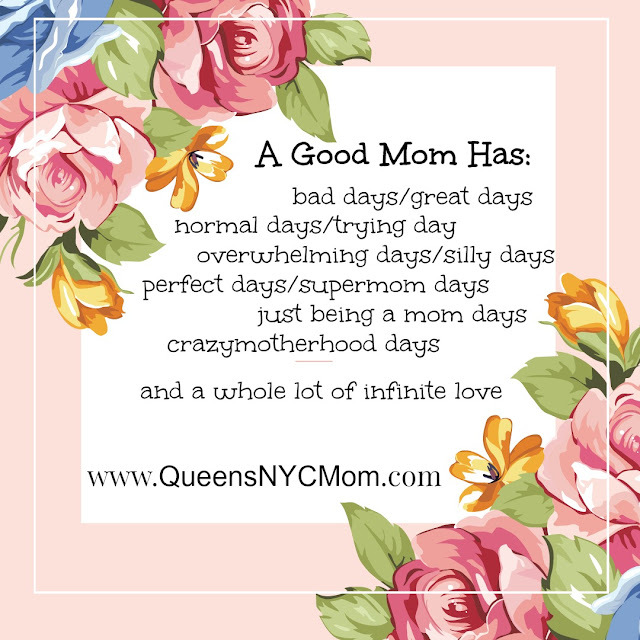 Sometimes good moms have bad days and that's okay. so true. we all have are really good days where we feel like supermom and then there are days where we feel like the worlds worst mom. it's part of life. So spot on! We might as well be diagnosed as having multiple personalities. LOL. I think my issue is doing more than I can actually handle. Most of the time I evolve into the Hulk. What a beautiful quote! I love it and its so true for me! I feel so frustrated with myself right now as I write. It just seems my family is either numb or oblivious to what I feel. Oh well, that's life and its okay. This is so sweet and so true! I like to use Mothers day to celebrate not just my mom, or let my kids celebrate me, but focus on all of the women in our lives that deserve the praise. Thank you for sharing my quote...I really appreciate it.